Mothercare plc, the leading global retailer for parents and young children, today issues the following trading update, which covers the 12 week period to 30th December 2017. · UK like-for-like sales decline of 7.2%. · Online sales decline of 6.9%. Online sales now represent c42% of total UK sales. · Total UK sales lower than last year, reflecting ongoing store closure programme. 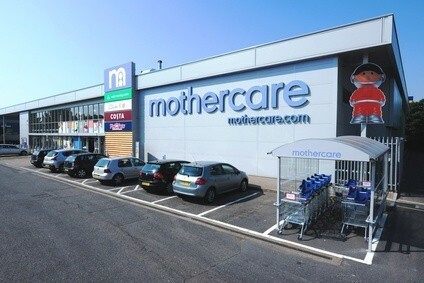 · Retail space at the end of the period reduced to 1.4m sq.ft, as planned, with 143 stores (139 Mothercare and four ELC). · Lower gross margins due to higher discounting, but positive sell through of stock and cash generation. · International retail sales were down 3.0% in constant currency and down 6.8% in actual currency, but key markets showing signs of improvement towards the end of the period. · Online sales growth of 8.5% in constant currency and 7.4% in actual currency. · Retail space at the end of the period c2.9m sq.ft with 1,131 stores. “As we signalled in November, there has been a softening in the UK market with lower footfall and website traffic resulting in lower spend in both stores and online. This trend has continued, resulting in our UK LFL of (7.2)% in the 12 weeks to 30thDecember. International trade was challenging in the quarter overall, but we have seen a return to moderate growth in the Middle East over the last seven weeks. Whilst this is positive news, it is too early to say whether or not this is the beginning of a more sustained up-turn in sales across the region. In Russia, our largest international country by turnover, we also saw a return to growth as the weather became colder, leading to improved trading. In our UK business, we took a conscious decision to remain at full price to protect our brand positioning prior to Christmas but to then discount more heavily in the end of season sale. We have subsequently seen good progress with strong sell through rates on Autumn Winter clearance lines albeit these carry lower margins and will lead to a further reduction in full year margin as a result. Group cash generation and inventory positions are both strong. In line with previous announcements and as part of our transformation strategy, we have taken decisive action to reduce our central cost base. The planned financial benefits of this will materialise in the next financial year. We continue to adopt a disciplined approach to cash management with a particular focus on controlling stock levels, together with stringent controls over capital expenditure. Taking this approach into account we expect net debt at year-end of approximately £(50)m, and at this level we have sufficient liquidity and covenant headroom within our existing facilities.